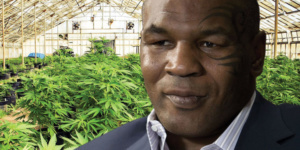 So it turns out that former heavy weight boxing champ Mike Tyson is also a big supporter of cannabis farming both for medical and personal consumption. On Jan 1, 2018 its being reported that Iron Mike has had a ground breaking event to unveil his 40 acre ranch. It’s a cannabis farm where you can stay; learn the ropes on growing marijuana all while enjoying the fruits of Mike’s labor. The ranch is just south of Death Valley National Park in a small town named California City. Although unusual for a high profile athlete and champion of his sport to publicly support cannabis it’s refreshing to see that he is doing exactly that. Half of the property (20 acres) is allocated for housing and facilities where edibles and extractions will be made. Also will be a state of the art amphitheater, where the Tyson Cultivation School will meet, teaching growers how perfect their own strains. In addition to these awesome facilities there will also be glamping sites (camping) and cabins allowing participants to enjoy the outdoors and some heavenly desert recreation. Not only is Mike Tyson turning out to be a philanthropist he is also running a company Tyson Holistic, which provide ranching jobs to Military Veterans with a focus on treating those vets suffering from PTSD.